Start by watching this video to get an idea on what you are in for then continue down through the guide to get more information and tips. 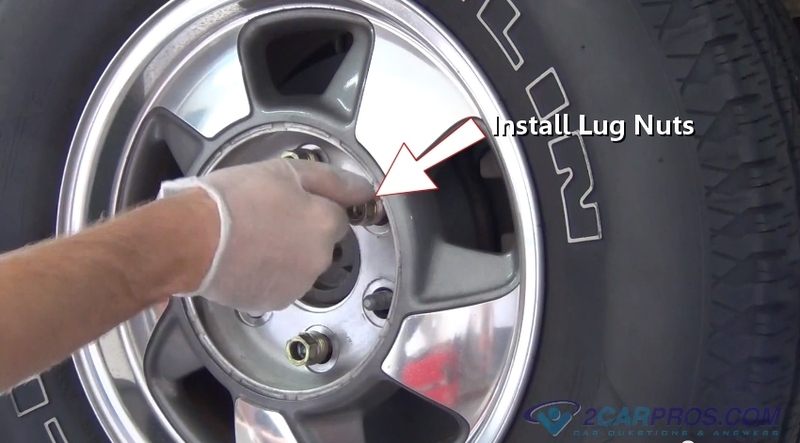 Begin with the vehicle on level ground, in park and the engine off and safely lifted in the air to perform a brake service. Step 2 - Once the lug nut cover is removed, a lug wrench or socket can be used can loosen the wheel lugs. 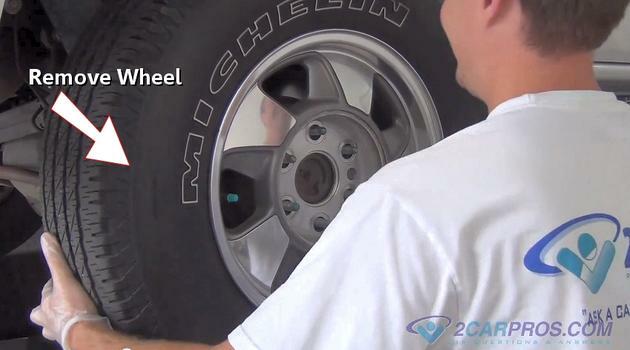 Step 4 - Then, grasp the tire and lift from wheel studs and axle flange. Step 5 - Using a pair of dikes remove the rotor retainer clip which is used in initial assembly and will not be reinstalled. 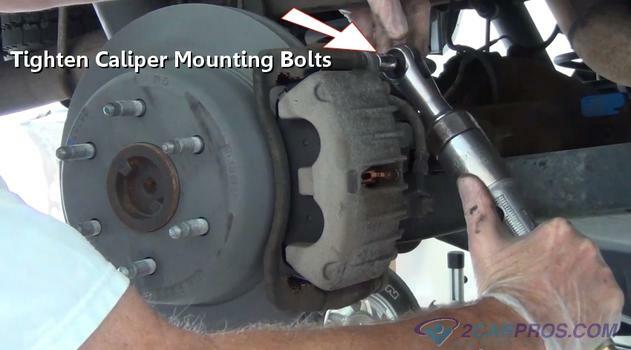 Step 6 - Next, use a socket to remove both upper and lower caliper mounting bolts. Use a wrench if necessary to secure the slide. 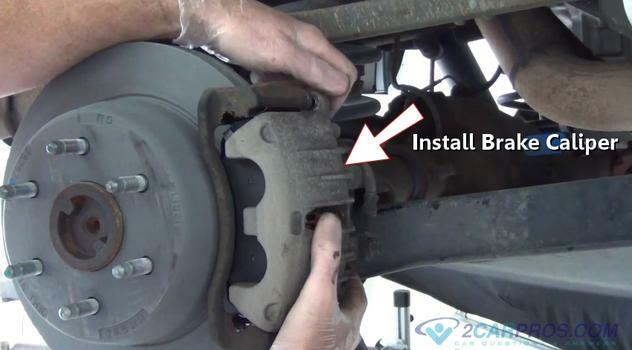 Step 7 - Once both upper and lower bolts are removed, grasp the caliper and lift it from the brake pads, the fit can be a little tight. 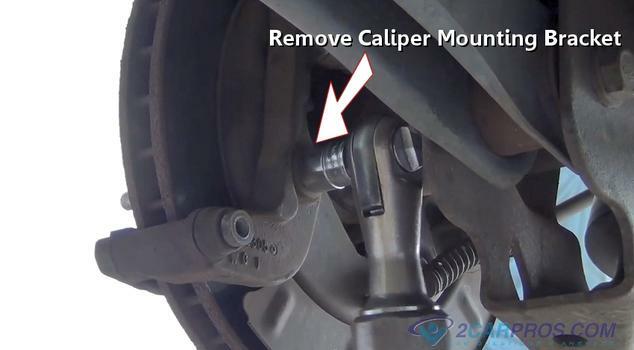 Secure the caliper away from work area, do not allow the caliper be supported from the brake line. 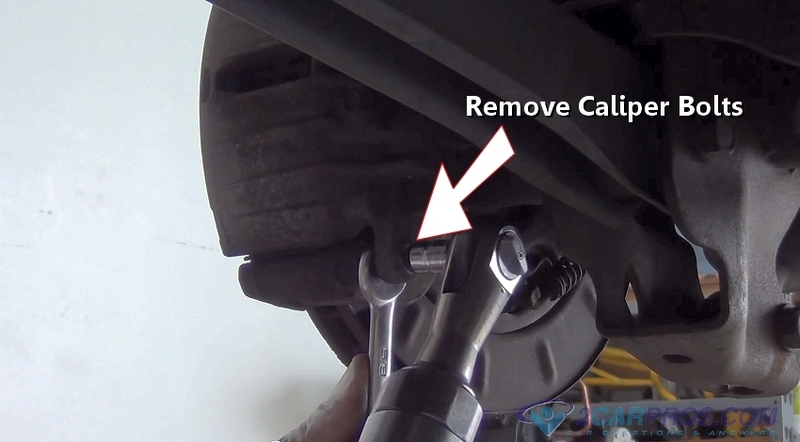 Step 8 - Next, use a small screwdriver to pry the brake pads from the caliper bracket. Step 9 - After the caliper is secure, loosen and remove both upper and lower caliper bracket bolts. 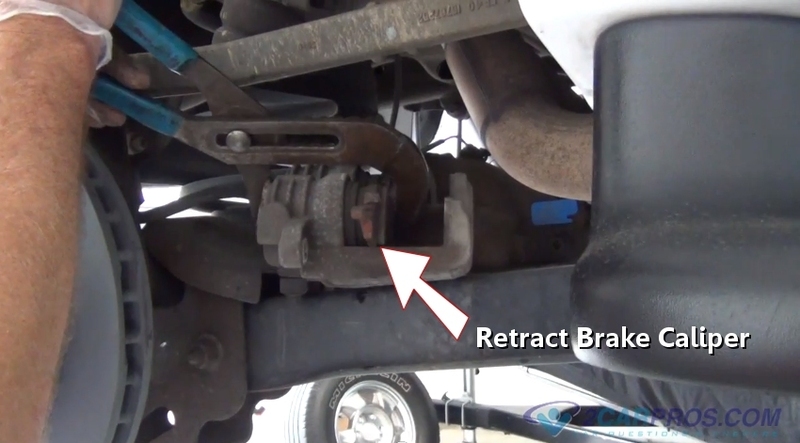 Step 10 - Once both caliper bracket bolts have been removed, grasp the caliper mounting bracket and lift it from the axle. 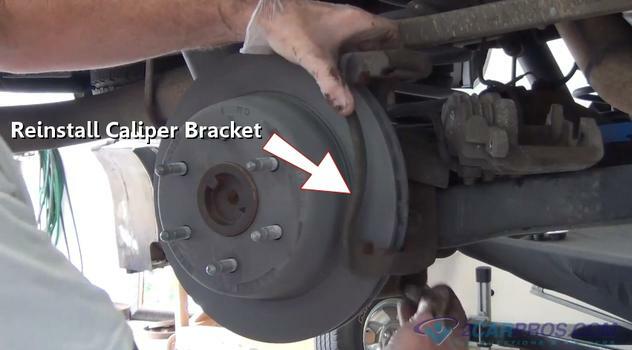 Inspect the caliper slides on the bracket and add a small amount of brake grease to lubricate. Step 11 - Next, use a hammer and strike the rotor near the edge of the axle flange, this will force the rotor free. 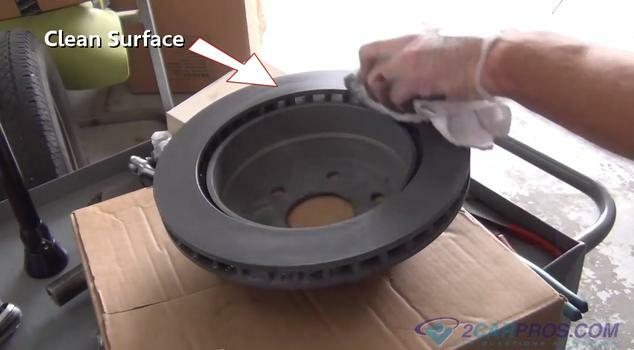 Step 13 - Match the old rotor to the new one, then clean the brake surfaces using brake cleaner. 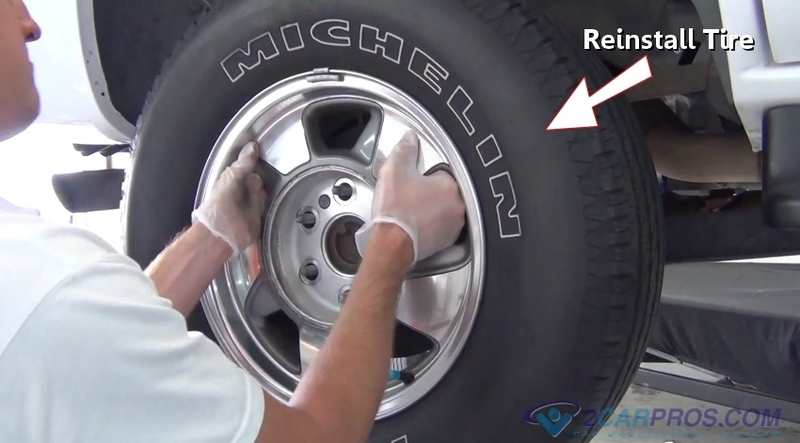 Step 14 - Then reinstall the rotor after cleaning the axle flange surface using a shop towel. 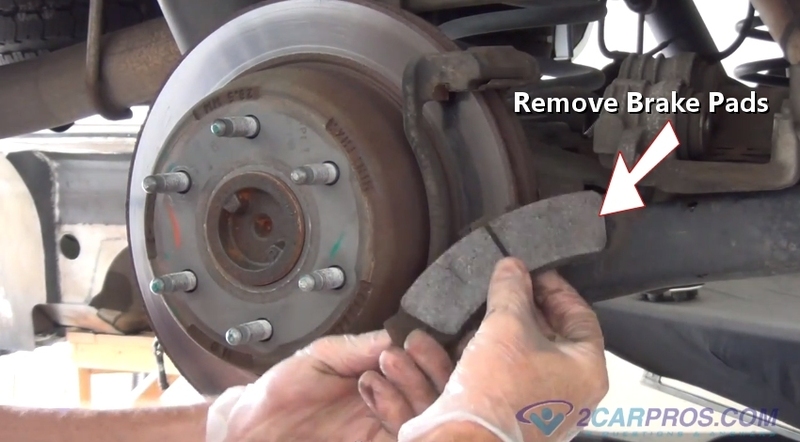 Step 15 - Install an old brake pad as a buffer between the tool and the caliper piston(s). 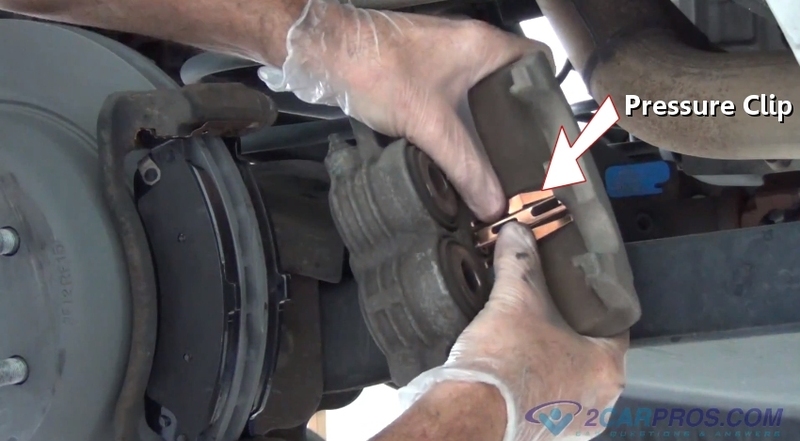 Using a large "C" clamp or channel locks move the piston(s) inward until fully retracted. 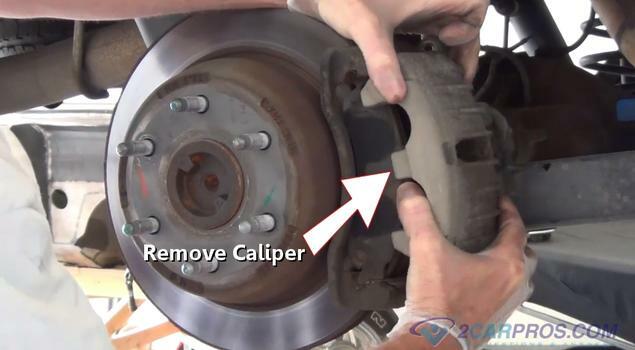 If a brake caliper utilizes a parking brake mechanism, a caliper reset tool is needed. Step 16 - Once the caliper has been retracted, insert the caliper mounting bracket over the rotor. Step 17 - After fitting the caliper bracket into place, insert the mounting bolts and tighten. 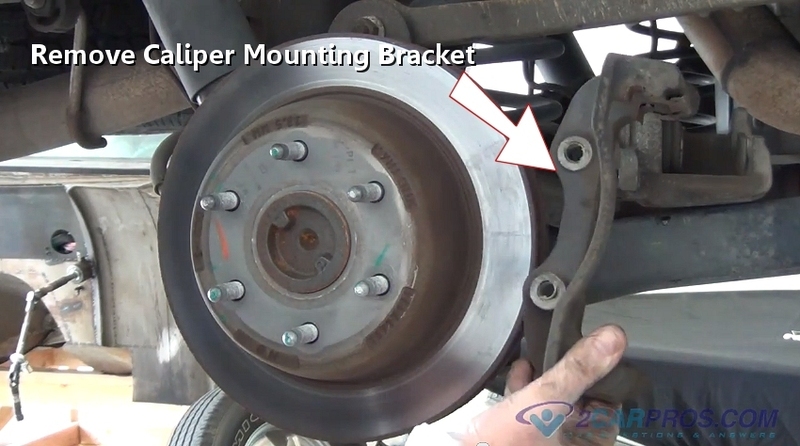 Step 18 - Next, remove worn pad stabilizer clips from the caliper mounting bracket using a small screwdriver. Step 19 - After removing both upper and lower clips, install new clips, premium brake pad sets include these clips. 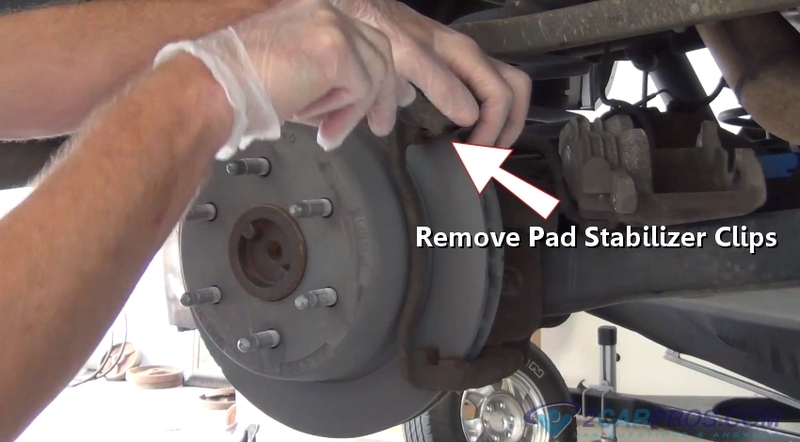 Step 20 - Then, remove the brake pads from the box and match to the worn pads to ensure proper fit. 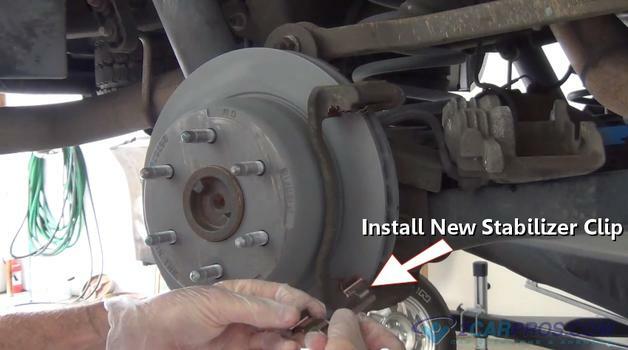 Step 21 - Install new brake pads into the caliper bracket while keeping the stabilizer clips in place. 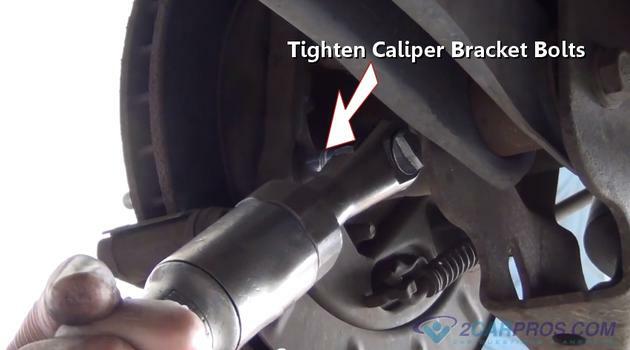 Step 22 - Some brake calipers utilize a pressure clip which should be replaced if provided or damaged, these clips help hold the brake pads securely while not in use. Step 23 - Next, install the brake caliper onto the brake pads, while retracting the brake caliper slides. Step 24 - Once the caliper is in place, reinsert the caliper mounting bolts and tighten securely. 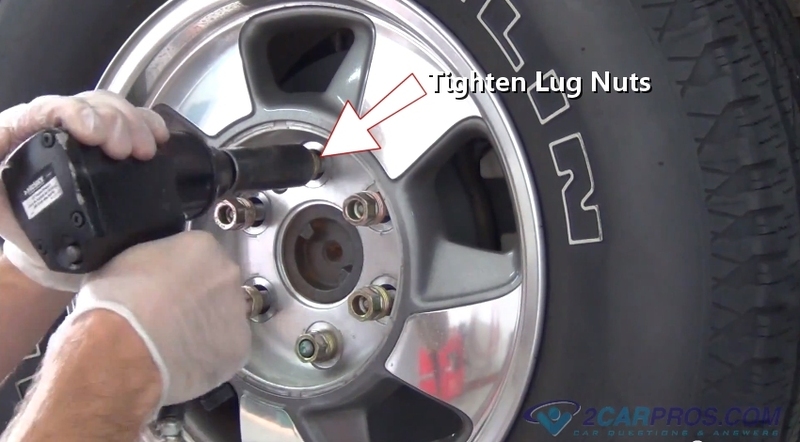 Step 25 - After the caliper mounting bolts are securely fastened, lift the tire into place. Step 26 - Then, install lug nuts while checking thread quality, never lubricate lug nuts. Step 28 - Once the lug nuts are tight, reinstall the lug nut cover. 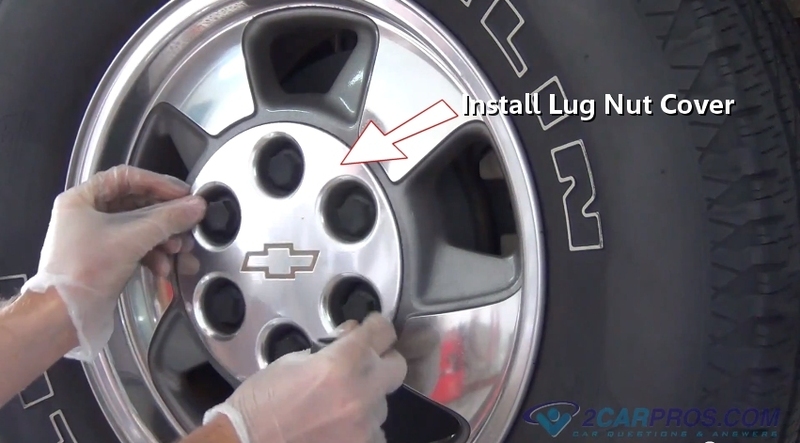 Step 29 - Tighten lug nut cover into place. Step 30 - Slowly press the brake pedal down, then, slowly allow the pedal to return to its original position. This will bring the brake pads to the rotor, initiating contact. 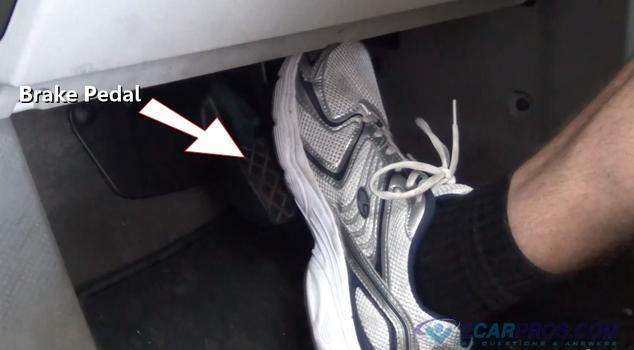 After completing the job check the brake pedal operation. 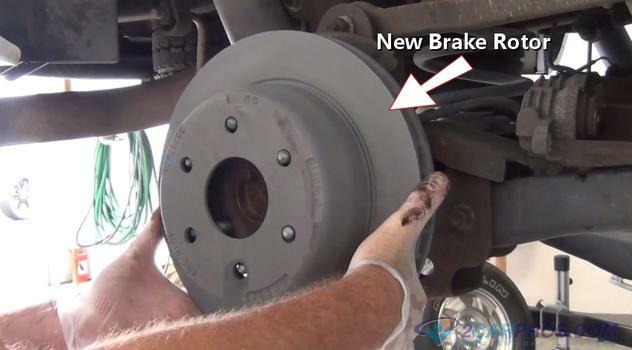 Because the system was never opened, brake bleeding should not be necessary, but if the pedal is spongy, bleed the brake system. Never operate a vehicle without normal brake pedal operation. While driving the vehicle, listen for strange noises as this is an indication of a problem in which repairs will need to be performed. Inspect brake fluid levels in the brake master cylinder. 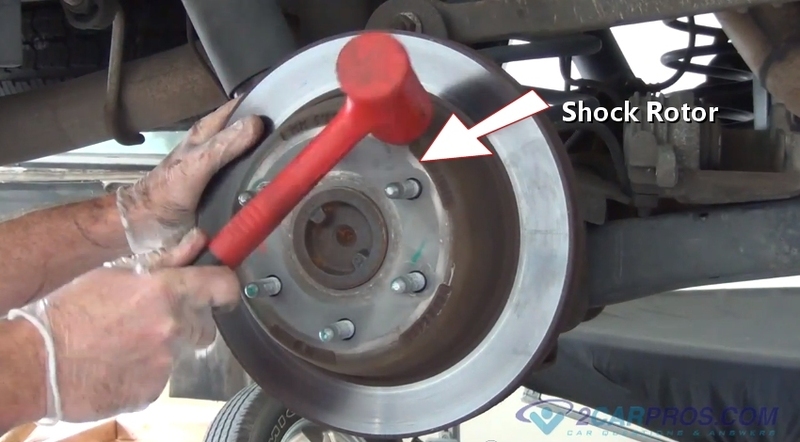 Brake pad design configuration may vary slightly, but the concept is the same. A rear caliper reset tool is necessary for parking brake integrated systems. 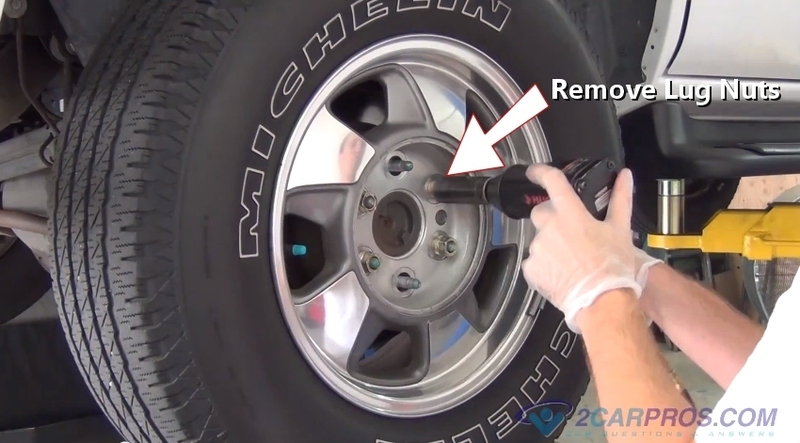 The reset tool screws the piston back into the caliper. 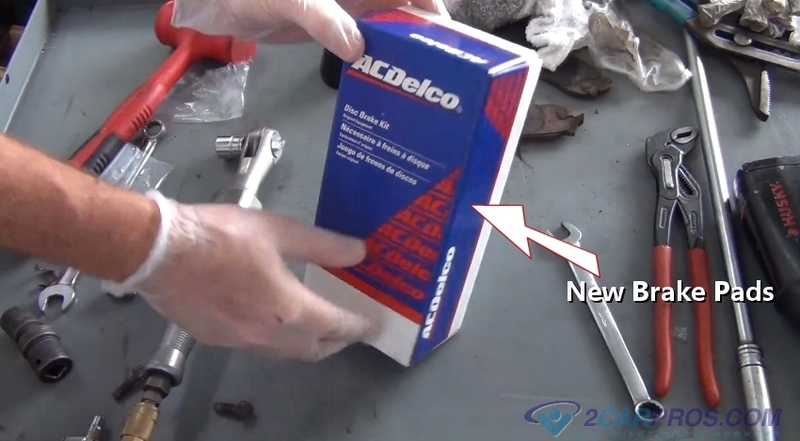 These calipers cannot be compressed with a clamping tool, it can only be reset with the reset tool. A locator slot is used on the inboard piston, which is fitted into a peg located on the backing plate of the pad. Rear disc brake pads offer improved performance and are not affected by moisture like conventional brake shoes. 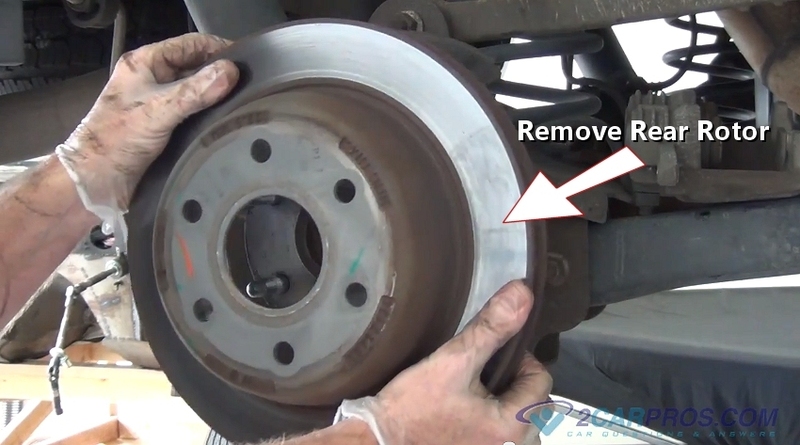 Brake pads wear down making a grinding noise. 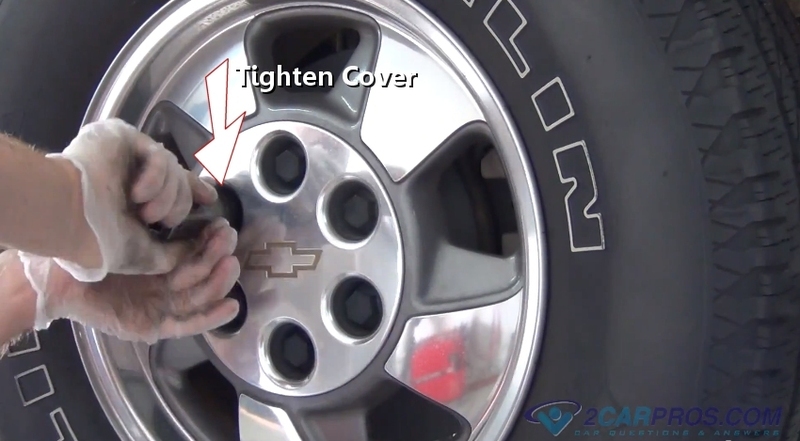 Caliper slides lock up, not allowing the caliper move causing premature pad wear. 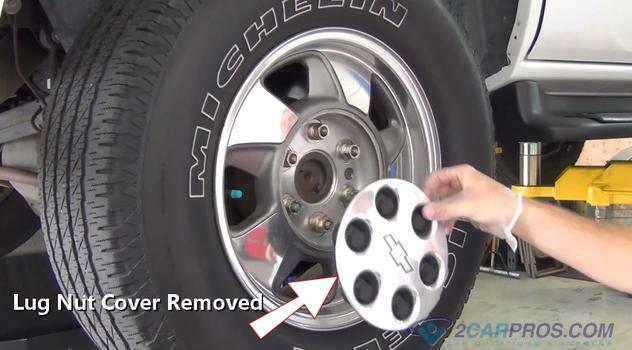 Inferior parts squeak, grumble and prematurely wear. 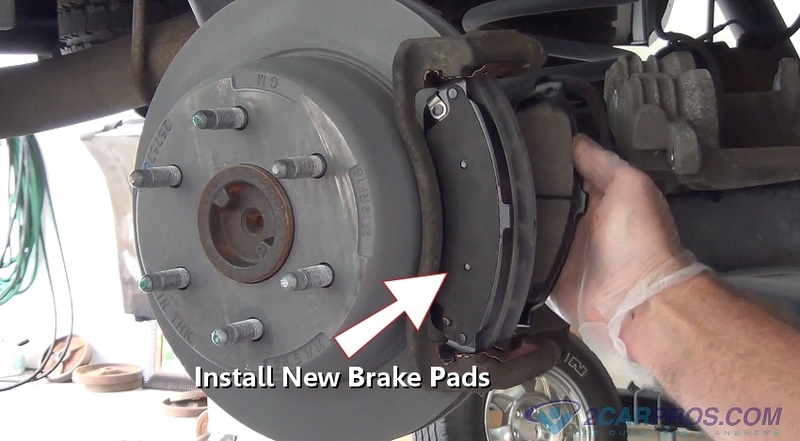 Bleed brake system after the job is complete. 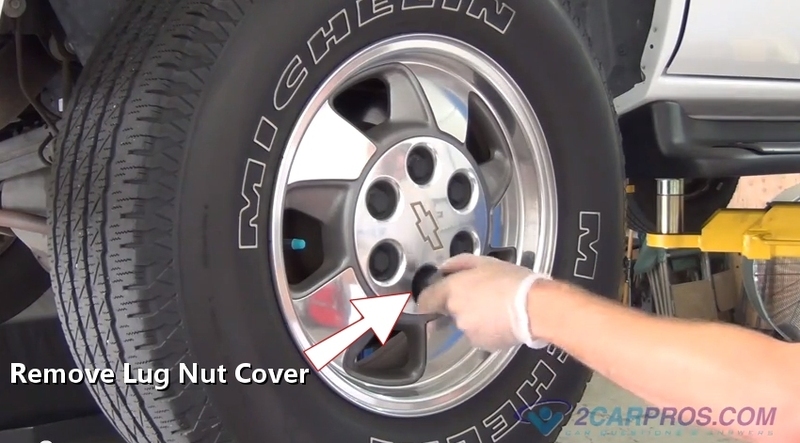 Check system brake fluid level.